Using Technology to Manage Your Practice Part 1 – The Official Kalix Blog. This post is by Claire Nichols co-founder and director of Kalix EMR and practice management solution. Claire is an Accredited Practising Dietitian, who has previously worked in private practice as well as clinical dietetics. Hi everyone, this is part 1 in a series of blogs that explore the ins and outs of using technology in private practice setting. It is based my experience working in private practice, as well as the lessons learned while starting my own business, Kalix. I do not come from a business background, nor a computing background. Starting Kalix was quite a steep learning curve for me, but overall rewarding experience. I hope you find this post useful. Starting a business like a private practice, making it profitable, and then ensuring it remains profitable can be hard, really hard. It’s a lot of long hours of work and persistence, lots of persistence. 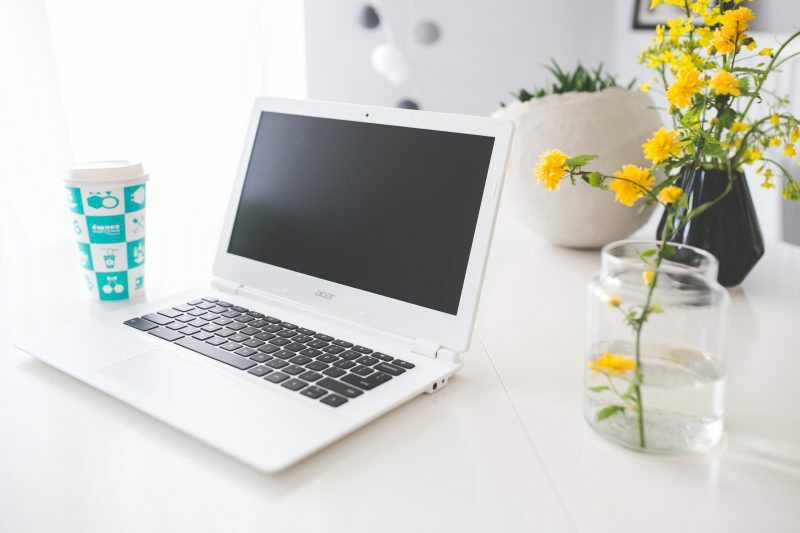 Keeping up with finances, admin, marketing and advertising, and not to mention staying up to date with the latest in your area of practice…well, it’s not a 9-to-5 job, that’s for sure. But if you achieve success, the rewards are great. You have the freedom to be innovative and creativity, building something that is your very own. You can set your own work schedule and of course the chance to be your own boss! 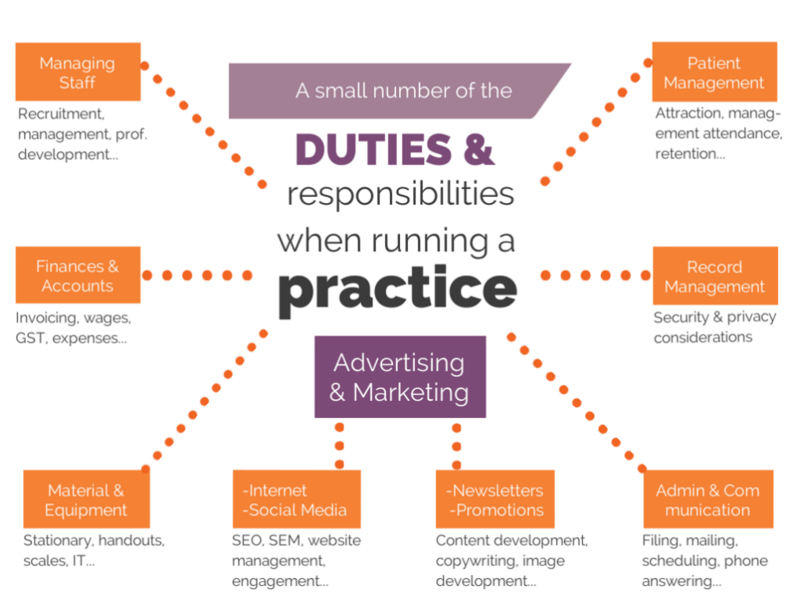 The image above demonstrates some of the duties and responsibilities when running a successful practice. Even though the completion of these tasks is essential, none of them directly generate revenue. Many of them are also very repetitive, e.g., admin tasks. And some can be beyond our training as health professionals e.g., legal, accounting tasks, marketing. The time it takes to complete these tasks, actually takes away from time that could be better spent seeing clients and generating money. Therefore, practically speaking, the time you spend completing on these tasks is actually losing you money. So the question is can technology help? Technology can help us to work smarter, and more efficiently, avoiding duplication, and wasted time. And we use technology in this way every day. For example, think of PCs, smartphones and global positioning systems (GPS). I don’t know how I could run a business without my smartphone or PC, I wouldn’t be sitting here writing this blog for one. And my GPS has saved me countless hours. I use it to find the quickest route when driving anywhere and now I no longer need to look at maps or ask for directions. Likewise, technology can be used in a private practice setting to improve the efficiency of these non-profitable (but essential) tasks and even automate them, i.e., make them happen automatically without any effort on your part. You can think of using technology as essentially partnering with experts in a particular area that you lack experience in, e.g., by using Mail Chimp you are accessing their 13 years of experience in an email marketing or by using a practice management program, you are utilizing their expertise in security and data management. 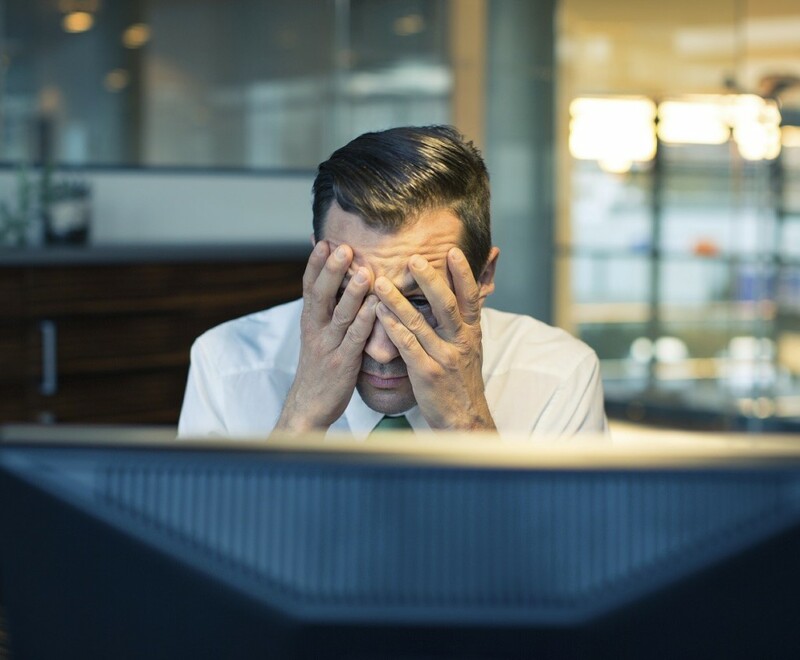 You do not want to use technology, whether it is the latest mobile device or cloud-based software solution, just because it is new or ‘trendy’. You need to examine the tasks you are looking at improving, whether it’s emailing marketing or scheduling clients’ appointments and consider whether the solution will actually make a difference. For example, if I only drive around my local area and I know my local area quite well, then purchasing a GPS may not be a prudent investment. What are the current costs for completing the task e.g. monetary value of time lost, the wages of admin staff, equipment costs? What are the initial costs for investing in this new technology or solution? What are the ongoing costs? The costs of the new technology or solution should not be higher than what you are currently spending. Why are you looking to adopt this new technology or solution? Do you want to complete a task faster? Are you looking to automate a job that takes up a lot of time? Are you seeking more consistency in how the task performed? You should have a clear understanding of the problem that you’re experiencing. You need to make sure that the technology or solution will solve your problem. Finally, you need to consider the “human” element. How will your clients respond to this new technology, if you are looking to automate a task that was previously completed by humans, how will this make a difference? The clever use of technology can make the difference between having a productive and profitable practice and running one that isn’t…Technology can assist a practice to become more efficient, through automation and the removal of unprofitable and wasted time. But remember, use technology smartly. That’s all for now. In part 2, I will discuss actual examples of technology which may help you run a more organized & productive practice. Pingback: Using technology to manage your practice Part 2 – The Official Kalix Blog. Pingback: Using technology to manage your practice Part 2 | The Official Kalix Blog.